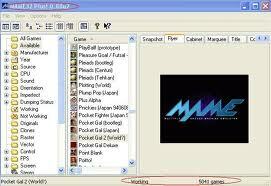 Free download latest version of MAME 32. Mame32 Download. Download Mame32 with Neo Geo. It short for Multi Arcade Machine Emulator, is application for computer. This software is used to play arcade games in your computer system. Download the file of Mama32 and then extract it. When you will click on download now button, a ZIP file will be downloaded. Simply extract it, and you will find an exe file mame32 and a compress folder neogeo. Do nothing with neogeo folder. It will only help you to run your games. Now you can play any game using its rom file. Just copy the rom folder and paste it within the folder where neogeo and mame32.exe are located. To play the game, open mame32.exe and refresh it. Select the folder with name “Available” from left side bar as you can see on image above. You can then see your desired game. Double click on the game and start to play.